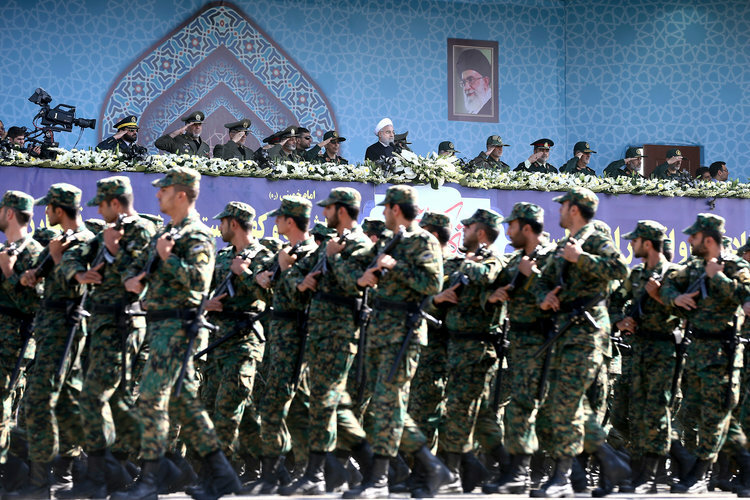 Gunmen attacked a military parade in the southwestern Iranian city of Ahvaz on Saturday, killing at least eight members of the elite Revolutionary Guard and wounding 20 others, state media said. Earlier reports described the assailants as "Takfiri," a term previously used to describe the Islamic State group. The semi-official Fars news agency, which is close to the elite Revolutionary Guard, said two gunmen on a motorcycle wearing khaki uniforms carried out the attack. State television showed images of the immediate aftermath. In it, paramedics could be seen helping someone in military fatigues laying on the ground. Other armed security personnel shouted at each other in front of what appeared to be a viewing stand for the parade. The semi-official ISNA news agency published photographs of the attack's aftermath, with bloodied troops in dress uniforms helping each other walk away. The attack struck on Ahvaz's Quds, or Jerusalem, Boulevard. Saturday's attack comes after a coordinated June 7, 2017 Islamic State group assault on parliament and the shrine of Ayatollah Ruhollah Khomeini in Tehran. At that point it marked the only attack by the Sunni extremists inside of Shiite Iran, which has been deeply involved in the wars in Iraq and Syria, where the militants once held vast territory. At least 18 people were killed and more than 50 wounded in the 2017 operation that saw gunmen carrying Kalashnikov assault rifles and explosives storm the parliament complex where a legislative session had been in progress, starting an hours-long siege. Meanwhile, gunmen and suicide bombers also struck outside Khomeini's mausoleum on Tehran's southern outskirts. Khomeini led the 1979 Islamic Revolution that toppled the Western-backed shah to become Iran's first supreme leader until his death in 1989. 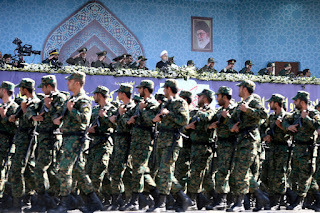 The assault shocked Tehran, which largely has avoided militant attacks in the decades after the tumult surrounding the Islamic Revolution. Ahvaz is the capital of Iran's oil-rich Khuzestan province, which in the past has seen Arab separatists attack oil pipelines.